In 2016, Orga launched the world’s first LED illuminated windsock with an integrated aviation obstruction light. This state-of-the-art signalling product is part of our helideck lighting system range and maximises offshore helicopter safety for hazardous areas. The illuminated windsocks are designed to give pilots a clear indication of wind speed and direction while taking off and landing in all weather conditions, during day and night. Why do you need a helideck windsock? In hazardous areas you need to rely on products that can assure your safety. Orga’s LED illuminated windsock offers a precision-cut reflective beam-shaping lens and prisms that redirect light to internally illuminate the windsock. This prevents pilots from being exposed to glare from floodlights. If an aircraft warning light is required, the AOL function can be activated without the need for additional cabling. In addition, high-grade materials and cutting-edge components, such as the sealed unit to protect sensitive electronics, along with excellent thermal management, ensure the highest level of reliability and durability. At Orga you get the sustainable competitive advantage you need in the offshore oil and gas industry. The functionalities and explosion proof characteristics of the LED illuminated helideck windsock make it perfectly suited for use in hazardous environments. The heliport windsock complies with UK Civil Aviation Authority (UK CAA) CAP437 Standards for Offshore Helicopter Landing Areas and International Civil Aviation Authority (ICAO) Annex 14 specifications. 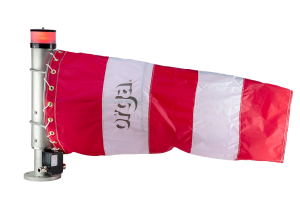 Why choose Orga’s illuminated windsocks? Our investment in technology and product research demonstrate our commitment to the continuous development of innovative smart signalling and helipad lighting solutions, such as the LED illuminated windsock with integrated aviation obstruction light. Our helicopter windsock offers a number of qualities and characteristics that make it your best option. These qualities include reliable wind-direction and wind-speed indication for helicopter operations, low cost of ownership and low power consumption. The helipad windsock is suitable for use in Zone 1 and Zone 2 gas explosion hazard areas. It features various operating voltages and, if required, a fully integrated aeronautical obstruction light. Our helideck windsock is ATEX/IECEx-certified. You can rely on Orga for our expertise and knowledge of regulatory requirements as they apply to harsh and hazardous environments.